FORT LAUDERDALE (CBS4) ― What was once a thriving community with families is now just a complex overflowing with filth at the New River Condos. When CBS4 News cameras first toured the property at the New River condos in Ft. Lauderdale back in November, we saw months' worth of garbage piled up and residents furious about living in filth. When CBS4 Reporter Carey Codd went back in early April, the garbage bags were gone. And so were the residents. 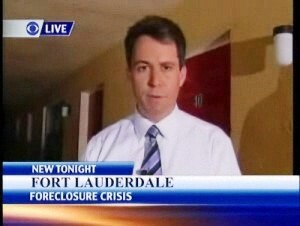 New River Condos, located at 510 N. 24th Avenue, appears to have fallen victim to the foreclosure crisis. The complex, which has more than 50 units, is a haven for the homeless and a burden to the people who still own units there. purchased units as investments. He surmises when the economy soured owners gave up on the properties and they fell into foreclosure. Unit owners stopped paying their monthly maintenance fees and the problems grew like the garbage. "The first thing that went was the insurance," Houston said. "After the insurance, the garbage stopped being collected. The city came in and took over that responsibility. After the garbage, the water got shut off." Once the water got shut off residents, like Houston, were forced to leave. 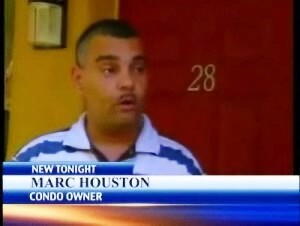 Now, Houston is stuck with a condo he cannot sell and a condo he cannot live in. He owes about $120,000 on his unit. "I'm in the process of working with my bank to figure out what can I do so that my credit doesn't get ruined," Houston said. Houston showed Codd around his unit. The locks are busted and it's clear that squatters have been inside. There are condo wrappers and a gallon jug containing what appears to be urine. The appliances and granite countertops have been ripped from the walls. Every unit CBS4 News saw has experienced some form of destruction or filth. Some units had dozens of dead roaches; others had dozens of liquor bottles. In some units, sleeping bags and clothes appeared to belong to squatters. Kimberla Terry-Miller and her husband Anthony are original owners. They bought one of the two-bedroom, one-bath condos soon after the condo conversion took place in 2006. The couple tried to sell their unit but was unsuccessful. They hope to turn the keys over to their lender in an action called a deed in lieu of foreclosure. "You can't even put it up for sale," Terry-Miller said. "No realtor wants to list it. No realtor wants their name on the property because they're telling me it's not a marketable property." She and Marc Houston said they stopped paying their on their mortgage because they needed money for an apartment. They risk a damaging hit to their credit scores. "When they cut the water off, I stopped paying my mortgage because I had to take that money to put down on an apartment so I'd have a place to lay my head," Terry-Miller said. Real estate lawyer Lorene Seeler Young said in extreme situations like this, ceasing mortgage payments is an option. She said having a foreclosure on your credit report is not the black mark it used to be, partly because of the overwhelming number of homeowners nationwide dealing with them. "In three or four years or in five years down the road the weight of a foreclosure on your credit report is not going to be as heavy as it once was," Seeler Young said. "Particularly if your other obligations have been current." Seeler Young said she is seeing more condo associations grappling with foreclosures, forcing them to levy special assessments on unit owners that remain. That financial burden sometimes forces other unit owners into foreclosure. It is a vicious cycle. She advises people to do four things. First, try to modify your loan. Second, try to sell the home, possibly in a short sale. Third, offer the property back to the bank through a deed in lieu of foreclosure. "I think a deed in lieu on my credit would look better than a foreclosure," she said, "because a deed in lieu says I kinda cared. A deed in lieu says I care about myself and I care about you." She said a deed in lieu of foreclosure saves banks money in litigation costs. The final option, Seeler Young said, is to stop paying the mortgage, save the money for an apartment and let the unit fall into foreclosure. At New River, a few items remain that prove a community once existed here. CBS4 cameras captured a baby doll lying in the road, Disney stickers on a kitchen window and baby shoe surrounded by dead roaches. 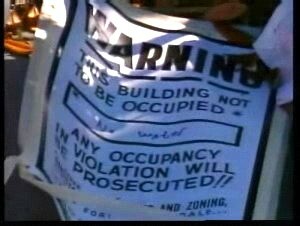 The city of Ft. Lauderdale cited the owners for code violations. A city spokesman told CBS4 the owners have ten days to restore water and vacate the buildings. If the work isn't completed in ten days, the city will step in to board up the units. The future of New River rests in the hands of the court system. For Marc Houston, it's a sad ending to what he believed would be a great place to live. "It's very upsetting because this is a place I called home for two years," Houston said.